After years of false promises, it looks like we are finally getting fiber optics in Lebanon. That’s what Minister Harb announced today in a joint-press conference with Ogero CEO Abdul Moneim Youssef. I’ve been following up on this issue for quite some time and I even managed to meet with Minister Harb recently and with some people who are working closely on the project, and it looks like it’s the real deal this time. In fact, my friend who has been involved since Day1 told me he’s moving out of Lebanon if this project doesn’t come true so let’s hope it does work! Before getting into details, the first question that comes to mind is who will be financing this project and will it stop once we get a new Telecom Minister? The cost of the project is in the hundreds of millions of dollars but the good part is that it will be auto-financed by the Telecom Ministry’s revenues which are set to increase year after year with the implementation of every phase. Moreover, the municipalities and all stakeholders will be encouraged to implement this project on time as they are getting more money out it. For example, 10% of the Telecom Ministry’s revenues are distributed to municipalities. More importantly, Ogero is committed to this 5-year plan so the administrative delays are no longer there. 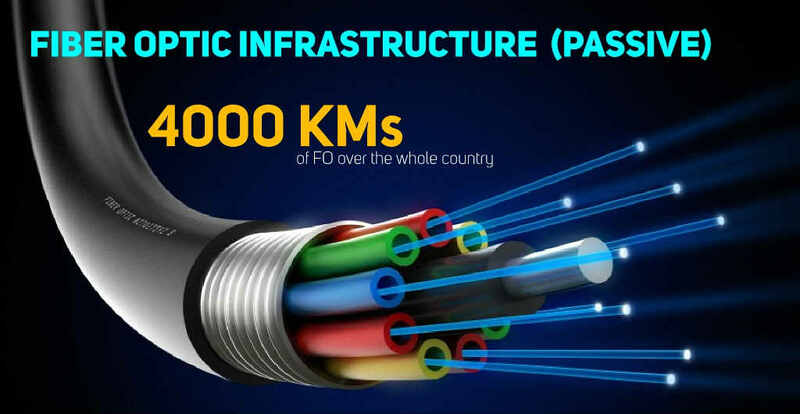 1- Lebanon will be fully connected through fiber optics. 2- DSL Services will be upgraded to VDSL2+ with 40Mbit/s . 3- DSL will be introduced to areas with no internet and exiting copper networks will be replaced by better ones temporarily. 4- 4G/LTE network will cover all of Lebanon within 2 years. Fiber Optics all over Lebanon! This phase will last 18 months between material request delivery, network design, implementation of work orders, testing of cables and putting customer in services. Organizations and Companies should start benefiting from fiber optics after 6 months. Internet stations will be connected to the cabinets in this phase and current DSL connections will be upgraded to +VDSL. DSL will also be made available to areas without coverage. 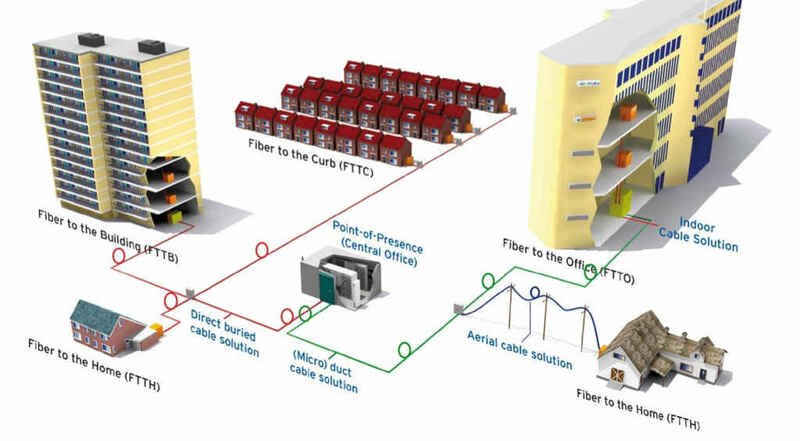 In the last two phases, fiber optics will gradually become available in households and for end users. Just to give you an idea about the speeds that we will start getting at home hopefully, we’re talking about an upgrade from the current 1 MBPS (up to 20 MBPS but no one is getting this speed) to 25-50 MBPS and up to 100 MBPS on VDSL2 before we move to fiber optics and gets speeds between 100 and 1000 MBPS! Only 7% of mobile users in Lebanon are enjoying 4G/LTE connections and Alfa and Touch’s coverage is still limited. Moreover, 3G coverage is still poor in several areas. Given that the infrastructure is already there, both companies will commit throughout the next 18 months to install new sites and expand their coverage to all Lebanese territories. 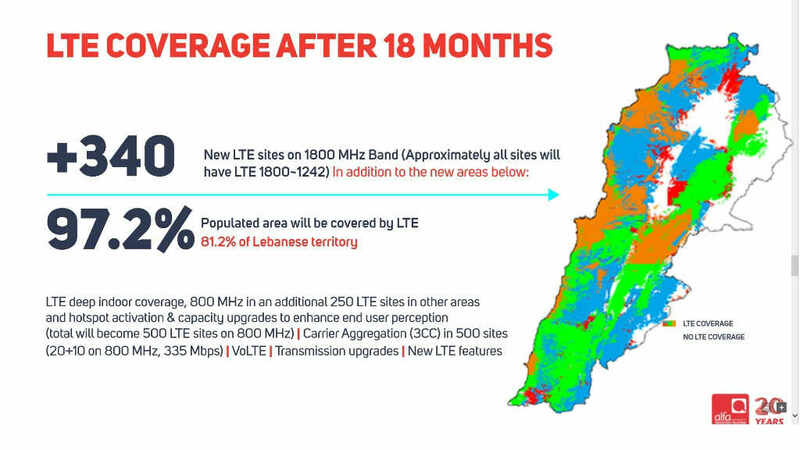 Alfa is expected to install over 600 new sites in the next 18 months and cover 75.5% of the Lebanese territory and provide the 4G/LTE service to 95.2% of populated areas. Similarly, Touch will install over 1000 sites to cover all of Lebanon. The expansion plan will also include an upgrade of all hardware and software to meet the increasing demand and network usage. With the ever increasing number of internet users in Lebanon, the Telecom Ministry is introducing a new hotline (1516) that will consist of a dedicated team (a sort of emergency unit) aimed at helping customers with internet issues. I will be calling them this week to see how efficient they are. 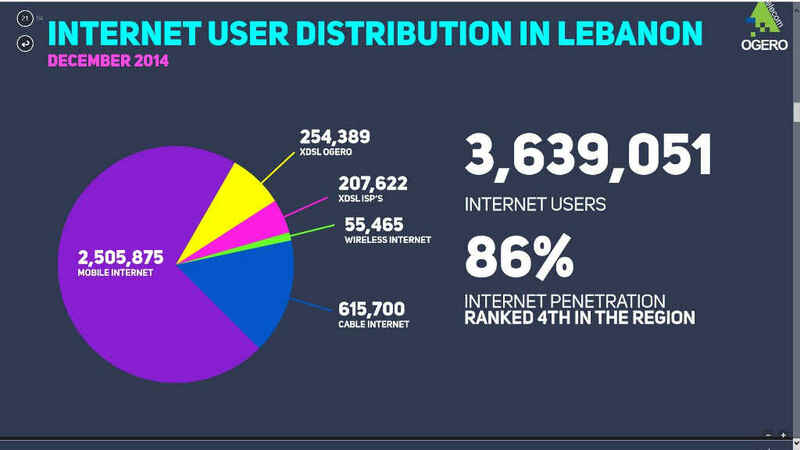 Just to give you an idea of the internet situation in Lebanon, there are 3,638,051 internet users in Lebanon, out of which 2,505,875 mobile internet users. 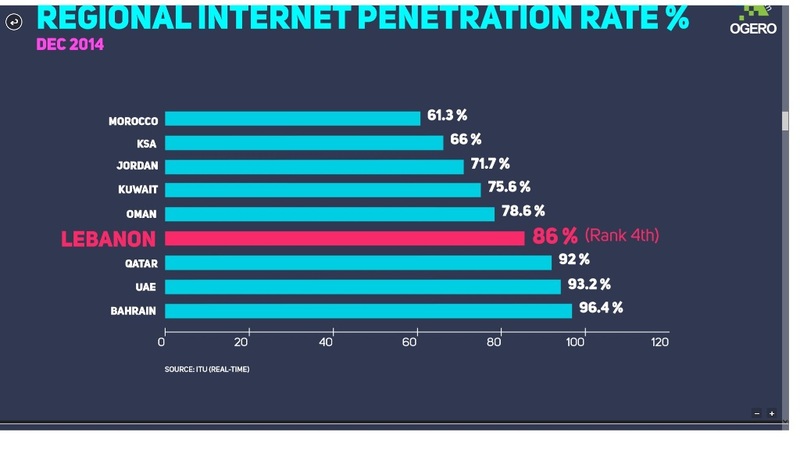 The internet penetration is 86% which puts Lebanon in 4th position regionally after Bahrain, UAE and Qatar. All in all, I believe we all agree that we need to catch up with the rest of the world and that mobile internet is the only thing keeping us connected. 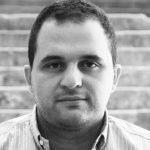 This project is desperately needed to put Lebanon back on track and maybe turn it into a regional tech hub. We have the talents, we have the infrastructure and now there’s a will from our officials and Ogero (I’m still finding it hard to believe) to make this happen so let’s hope for the best. Needless to say, enhancing the internet connectivity has to be accompanied by a drop in prices and a considerable increase in the quotas, but I’m sure this will come as soon as the concerned parties start thinking out of the box and realize that they will make more money and improve the economy by making the internet cheaper and more abundant. Do they mean all Lebanon Exchanges? All buildings? All homes? Definitely not all homes or buildings..
All of this probably won’t extend beyond the borders of Beirut. I don’t want to be pessimistic but until I see it implemented live in homes and businesses, I’d take all of this with a grain of salt. We have heard such statements too many times now and all we have seen is a little upgrade here and there. Anyone remembers the “pilot fiber optic connections” testing in Ashrafieh and Hamra area? That was years ago when Bassil was the Telecom minister. Every minister comes and brags about this and that and then very little would be achieved. If anything, what we have right now is a low quality DSL connections that don’t give the promised speeds. A good number of residential areas in Lebanon can’t even have more than 1 Mbps speeds. Even in Beirut, I live in Bachoura, and I couldn’t even get more than 3 Mbps speeds. With the crappy current copper line infrastructure, I can’t even imagine how are they going to achieve these speeds. So I until I see these speeds live at residences, I won’t believe any of that. It’s true, ogero has the abilities. I’ve seen it live and I can provide screenshots as needed. I’m not here to defen ogero. Bas your crappy DSL speed is due to many factors: the distance from the C.O. first of all, the cable from your building to your apartment, and the DSL modem you’ve got. While if you’re connected to a private ISP these guys are ASSHOLES 🙂 they say the speed is up to xmbps they connect as many users as you could get 0.01mbps < dialup56 speeds in peak times. How’s that VDSL2+ going for ya? One year, one month into the 2020 plan and not a single update. do i have the chance to contact you ?? please contact me on the Email below..
where’s all the optimism now? Are you still following the progress of these projects? We’re not hearing anything about it in the media, which often really means, in a country like lebanon, that it’s frozen somewhere. Aren’t you hearing what’s happening with Ogero? When will touch’s LTE get expanded?